musical notes that are in harmony due to the relationship between their frequencies. 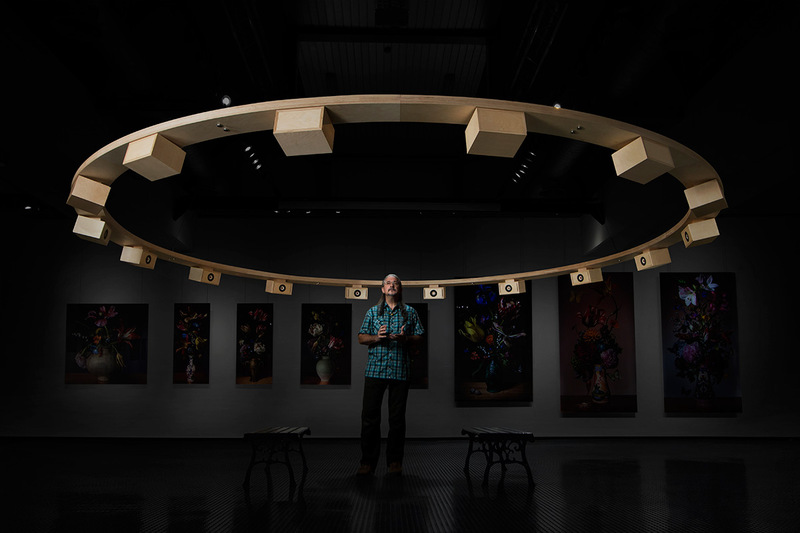 The “Consonance” sound sculpture is a 360° multi-channel sound-art installation consisting of 16 specially-designed speakers configured within a large ring. The audio content presents a rare vocal music performance portraying one of the world’s most mysterious and renowned ethnic music works, as sung by Taiwan’s Bunun aboriginal tribe where “circle singing” is a traditional artform. This groundbreaking 16-channel audio presentation creates a stunning interactive audio experience, inspiring awe and appreciation for indigenous music through technology, sound and art. The logistics, as well as the symbolic equality of circle singing, presents a conundrum for audio production due to the inherent “left-centre-right” configuration of stereo recording and playback systems. By recording and processing each singer discretely with premium microphones, pre-amps, and analogue-to-digital converters, and with specialized playback audio components, “Consonance” presents this renowned music in a strikingly vivid, interactive, ethereal and larger-than-life portrayal, while remaining true to the traditional performance. © Matthew Lien. All rights reserved.